If you are interesting in taking Fran Phaneuf’s class in botanical illustration, but want a better idea of what kind of painting we are doing, come to the First Friday opening of the “Unfurled” exhibit at the River Arts Gallery in Chestertown, Maryland. Fran has put together a small exhibit of her own work, plus pieces from the class, and I’m happy to say that two of my paintings are in it! She has also written up a description of the class/workshop, which is open to everyone. Beginners are welcome! The exhibit will be up for about two weeks if you can’t make it Friday night. The class is Wednesday mornings at Heron Point from 9:00 a.m. to noon. Fran and I will both be at the First Friday opening. Hope to see some of you there! 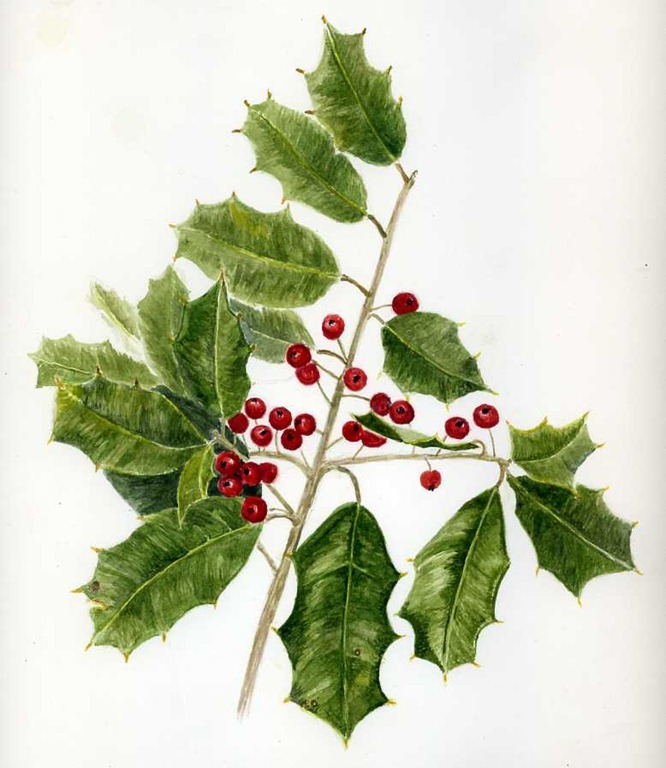 Above: Ilex opaca, American holly, by Barbara W. Ellis, which isn’t one of the paintings in the show!